UPDATE: Interim president Adly Mansour and both presidential candidates, former Defence Minister Abdel Fattah Al-Sisi and Nasserist politician Hamdeen Sabahy cast their ballots early Monday morning. Surrounded by large crowds, Al-Sisi eventually made his way inside his polling station in Heliopolis. Sabahy, who was swarmed by journalists and photographers stopped to take their questions outside his Giza polling station. 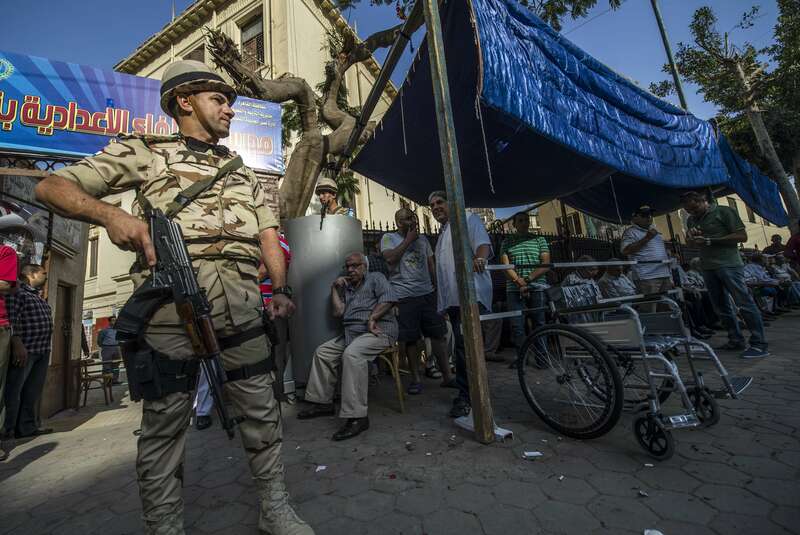 Polling stations across Egypt opened on Monday morning for the country’s presidential elections. Voting is scheduled to go through Monday until Tuesday at 9 pm and will determine in a poll between Al-Sisi and Sabahy, with the former widely expected to win. The armed forces and the Ministry of Interior have announced coordinated efforts to secure polling stations and government installations during the two days of voting. Voting for Egyptians abroad started on 15 May and ran until 19 May with Al-Sisi winning in a landslide of approximately 94.5% of valid ballots cast. On Sunday interim President Adly Mansour, whose tenure will conclude at the conclusion of the elections, said in an address that state institutions are without bias toward either presidential candidate and were only committed to proceeding with the country’s transitional roadmap. Subsequent elections for the House of Representatives are expected to take place later this year. These presidential elections represent the seventh time the polls have opened in Egypt since 2011.